GREENFIELD — Wendy Perry is the woman you see sitting on the ground next to Green Fields Market selling her homemade earrings and assorted jewelry. She hopes to do birthday parties one day with children learning from her how to make tie-dye T-shirts. Wendy Perry on Main Street in Greenfield, on Tuesday, Nov. 07, 2018. 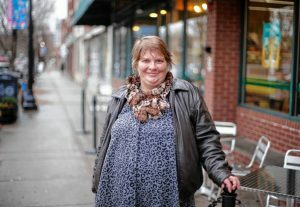 Perry spends her days in front of the Green Fields Market on Main Street receiving food donations, collecting spare change, and chatting with those who walk by her. 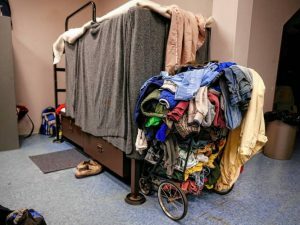 A former resident of the Winslow apartment building, but now following an eviction, she spends her nights at the Wells Street ServiceNet shelter. Perry says she used to be a manager-in-training at a McDonald’s in Northampton. She used to live in the Power Town Apartments in Turners Falls. Now she lives in a homeless shelter. She has been homeless on and off throughout her life, most recently after an eviction from the Winslow Apartments this spring, where she paid $226 a month for the subsidized studio apartment. She was told to leave for violating her lease on the grounds of allegedly harassing other tenants for cigarettes, questions over threatening other tenants and for having a man stay over for a week in November, all of which she continues to deny happened. Perry is currently living in the ServiceNet Wells Street overnight shelter. She prefers the shelter to living in the woods as some homeless people do, and this past summer she wasn’t about to camp on the Greenfield Common as others did. For Perry, homelessness is a path she’s stumbled down before and a place she hopes to climb back out of, again. In the meantime, she sleeps each night in the Wells Street shelter for homeless adults – hovering between life on the streets and having a place of her own. In the past decade, nearly a thousand people have come and gone through the state-funded 20-bed Wells Street shelter, which is intended for individual adults who present themselves sober in the evening needing a place to sleep overnight. The shelter started up in Montague City in 1993 and later was moved to Greenfield in 2012 so the homeless were closer to central services like free meals and counseling offered by anti-poverty agencies, the Salvation Army and churches. 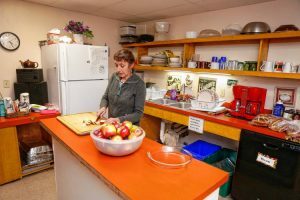 Volunteer Jan Atamian preps food in the ServiceNet kitchen Thursday in Greenfield, Nov. 15, 2018. 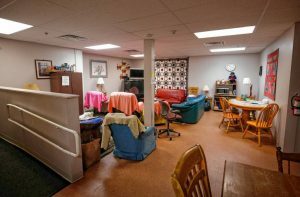 The shelter, which costs ServiceNet about $185,000 a year to run, allows for a maximum 90-day stay. The waiting list currently hovers around 20 to 30 people. While in years past in the summer there would be times when there were available beds, now there’s never an open bed and there are always about two dozen people on the waitlist, managers of the shelters say. At the shelter, ServiceNet offers a host of social services, including counseling to help people navigate the job and housing market, and to guide people toward other services they may need like addiction help. People who use these services often say the social workers mean well, but it rarely leads to anything tangible. The typical length of stay for a person at the Wells Street shelter in the late 2000s approached 50 days, about half of the maximum allowed time. By 2016, the average length of stay had risen to 111 days, technically past the cutoff, although a harsh winter or summer could allow for some wiggle room. As of late October, the average length of stay was in the high 80s, but the coming cold, months will likely boost that number beyond 100. Personal possessions inside the men’s dorm at the Wells Street ServiceNet shelter on Wednesday afternoon in Greenfield, Nov. 14, 2018. That people often stay longer now is a side effect of the tight market for affordable apartments, the managers at ServiceNet say. When people get federal Section 8 rent vouchers, which allows them to pay 30 percent of their income for rent at any landlord’s property, there are fewer places where they can to use a voucher or where they’ll be successful in using it, even though, by law, a landlord cannot reject a prospective tenant for using a voucher. She said it’s a “real fight” for people to use their vouchers within the six months allotted, and even then on the second or third extension, it might not be possible to find housing. The social workers attribute this to the lack of affordable, available apartments generally, creating a landlord’s market where they can be more selective. In general, most of those who leave the shelter haven’t found anywhere to go or at the least don’t report it. About 12 percent of the time they find a rental, 12 percent they go to transitional housing for those in recovery, and 13 percent of the time they stay with family or friends. There are other shelters around Greenfield, but these are not traditional overnight shelters, which sometimes have been augmented in the bitter cold of winter by churches opening their halls overnight. ServiceNet also runs the Greenfield Family Inn, which opened in 1987 and increased in size in 2015 following the end of the state’s controversial practice of sheltering homeless families in motels. Many dozens were placed in Greenfield motels from Springfield and metro Boston as a result of the state’s policy of guaranteeing shelter to all families. After criticism about keeping families for months in cramped motel rooms, the homeless families were moved out, but those people didn’t all find stable homes. Rather, many of them switched to shelters like the Family Inn. The common area and occasional sleeping space at the Wells Street ServiceNet shelter on Wednesday afternoon in Greenfield, Nov. 14, 2018. The Family Inn used to have 24 beds with six apartments, but then it was bumped up to 52 beds in 16 apartments. By 2016, it saw a 130 percent jump in the number of people who came through, from 83 in 2015 to 191 in 2016. At the Family Inn, ServiceNet must take in families who do not have housing, because of the state’s right to shelter policy. 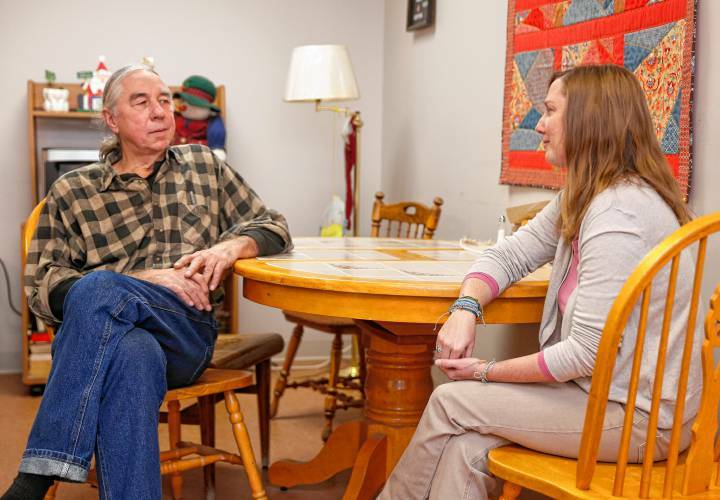 The families who come to the Family Inn sometimes are from Franklin County and other times they come from other parts of the state, at times fleeing domestic violence. The program, which costs state-supported ServiceNet about $658,000 a year to run, intends to help the family stabilize and reinforces that they will end up somewhere, because of the state policy. There is a more extensive network of resources available to these families than for those who check into the adult, overnight shelter on Wells Street, partly because there is more funding for it. From the Family Inn, nearly 70 percent of people have some plan of where they are going afterward. It can be tricky for the staff there, because when they try to place the clients in a home, renting from a landlord, they don’t want to burn any bridges. The first year, typically there is state money from the HomeBASE program to stabilize the family so it can pay rent, but after those 12 months, it’s more or less up to the family to figure out how to sustainably pay rent, which can lead to trepidation on the part of landlords to lease to them in the first instance. Many times it works out, but when it doesn’t, it can sour the whole experience for a landlord, Lemay said, eroding an already narrow rental market for low-income people. The Family Inn has seen about 14 percent of its families return for a second visit within 12 months from leaving, but rarely for a third time. About 13 percent of people leaving Wells Street came back within the year and on the rare occasions they come back a third time within the year. Nearly 1-in-4 of the people who have come through the overnight shelter in the past decade returned at some point though, and about 10 percent of them have been back a third time. For some in shelters, which don’t tolerate substance abuse, moving up a rung on the housing ladder may be difficult if there is a perception that drugs are more prevalent at certain subsidized housing projects. Wendy Perry might leave Greenfield if she doesn’t find an apartment by winter, she says, although she’d prefer to stay. About a year ago, her daughter, who is living in Texas, found her on Facebook. “I want to at least visit her,” Perry said. But she’s still pulling to live in Greenfield, where she’s built a community. Finding an apartment by year’s end, she says, is her cutoff. TOMORROW: Subsidized housing and its hurdles.